Dubai is the largest and most populous city in the United Arab Emirates (UAE). It is located on the southeast coast of the Persian Gulf and is the capital of the Emirate of Dubai, one of the seven emirates that make up the country. Dubai was rated as one of the best places to live in the Middle East by U.S. global consulting firm Mercer. 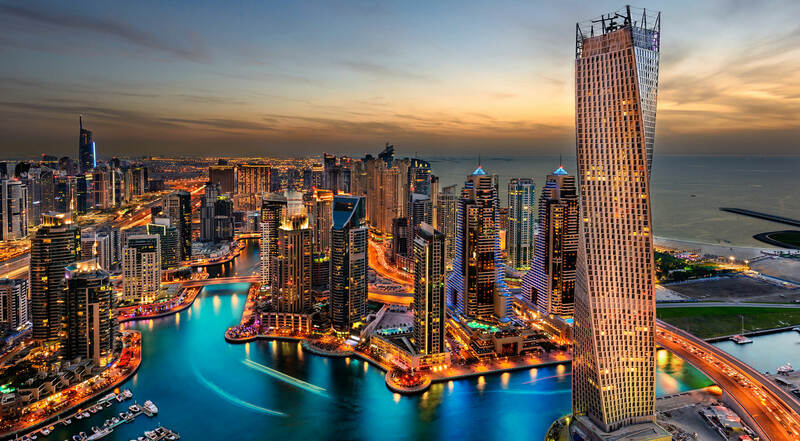 Dubai emerged as a global city and business hub of the Middle East. It is also a major transport hub for passengers and cargo. The emirate’s Western-style model of business drives its economy with the main revenues now coming from tourism, aviation, real estate, and financial services. Dubai was recently named the best destination for Muslim travellers by Salam Standard. Dubai has recently attracted world attention through many innovative large construction projects and sports events. The city has become iconic for its skyscrapers and high-rise buildings, in particular the world’s tallest building, the Burj Khalifa. Dubai is also known as the City of Gold, because a major part of the economy is based on gold trades. A City Mayors survey ranked Dubai 44th among the world’s best financial cities in 2007, while another report by City Mayors indicated that Dubai was the world’s 27th richest city in 2012, in terms of purchasing power parity (PPP). Tourism is an important part of the Dubai government’s strategy to maintain the flow of foreign cash into the emirate. Dubai’s lure for tourists is based mainly on shopping, but also on its possession of other ancient and modern attractions. Dubai has been called the “shopping capital of the Middle East”. Dubai alone has more than 70 shopping centres, including the world’s largest shopping centre, Dubai Mall. Dubai is also known for the traditional souk districts located on either side of its creek. Dubai has a rich collection of buildings and structures of various architectural styles. Many modern interpretations of Islamic architecture can be found here.